Martin Padgett February 26, 2014 Comment Now! It's been ten years already, but if you still haven't absorbed the reality of a Porsche SUV, brace yourselves. There's a second one--and it's probably the best crossover SUV we've driven. Let us first-drive you into reality with the 2015 Porsche Macan Turbo, the vehicle that will cement Porsche's presence in utility vehicles, while you scour for all the loose change you can spare. Like the Cayenne, the Macan shares some VW Group DNA--in this case, about a third of its parts with the Audi Q5. Turbocharged V-6s are standard with all-wheel drive, with a turbodiesel and possibly a turbo four to come. It's even built alongside the Cayenne in Leipzig, Germany. Porsche's turned part of Leipzig into its own Hamtramck, building a 2.3-mile test track, as well as a visitor's center that's best described as a Close Encounter of the Patti Labelle Kind. But as Porsche's chief designer Michael Mauer says, "The Macan has to be much more than a shrunken Cayenne." It has to be more sporting than a BMW X3; more grunty than a Mercedes GLK off-road; more than an Audi Q5 cannibal; more evocative than an Evoque. Is it? Yes, but it's a matter of degree. The Macan S, at $50,895, threads its way through those thorny comparisons. A $73,295 Porsche Macan Turbo, with premium suspension and torque vectoring, blasts by them, removing any doubt. It's a vehicle that lives up to every letter of the SUV acronym. The only shocks you'll get with a Macan are the ones under the sheetmetal. It's styled with all the favorable features of the bigger Cayenne, with a faster rear glass, and with attractive new blades down its sills to lighten its visual load. Compressed into a shorter span than on the Cayenne, the same cues work themselves out well. Porsche's usual massive front-end intakes and strakes and compound headlamps stack neatly. The hood has no cutlines, save for big headlight cut-outs: it's wrapped over the front corners to incorporate what would be the front fenders, which means the actual fenders are small triangular panels aft of the wheels. From the side, the Macan factors in a deeper shoulder line than the Audi Q5, and a more steeply sloped rear glass, which Porsche believes will connect the Macan with its 911 more than that Q5. The rear end's simple and spare, with LED taillamps banded slimly on the wraparound tailgate. Spotters can pick out body-color brackets on the front air intakes on the Macan Turbo, and gray-metallic ones on the Macan S, unless they've been replaced with optional carbon-fiber inserts. It's easier at the rear, where the Macan S has four round exhaust outlets, and the Turbo four squared-off tips. The Macan's cabin is smothered in buttons and switches, not incomprehensible TFT screens, and it feels as appropriate as the left-mounted ignition. At least a dozen buttons flank either side of the shift lever. There is a central screen, but it hosts secondary controls--the primary functions represent in the gauge binnacle, with a high-resolution screen in the right pod serving as a redundant display. That's the economic lesson at the heart of the Macan: spend more, love more. To get the classic Porsche experience--scalding acceleration, effortless grip, impeccable balance--you need to tick a few boxes. When you do, make sure you belt everything down. Except your debit card. That will need to fly. 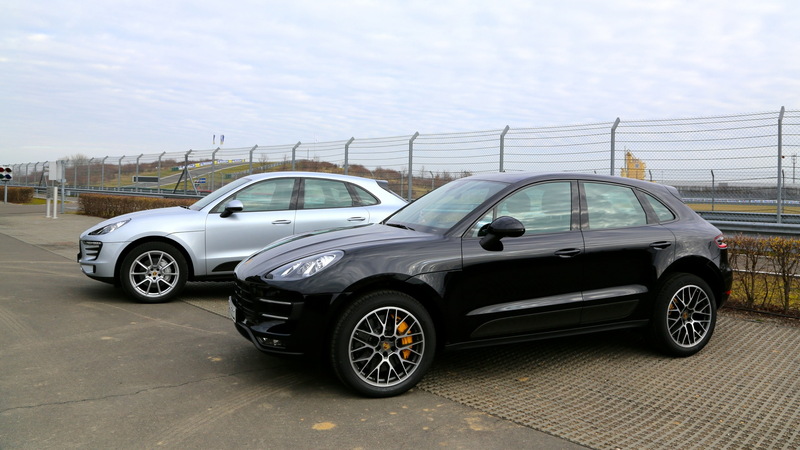 We drove various trims of the Macan on the autobahn, on a 3.7-mile off-road trail, and at Porsche's F1-certified test track. The "base" Macan S acquits itself just fine on all those surfaces, but it also invites comparisons in a way the turbo doesn't. Powered by a turbocharged 3.0-liter V-6 with 340 horsepower, with standard rear-biased all-wheel drive (with the rear wheels always delivering some power) and Porsche's dual-clutch PDK transmission, the Macan S doesn't slouch its way through any driving mode. Porsche promises 0-60 mph runs of 5.2 seconds, and a top speed of 156 mph, Add the Sport Chrono package for swifter transmission shifts and throttle tip-in, and the Macan S accelerates to 60 mph in 5.0 seconds--keen for a vehicle weighing in at more than 4,100 pounds. Like an SQ5, a bit quicker than the uprated turbo-six X3, possibly the upgraded '15 Evoque, too. We still see a bright future for the Macan S as the suburban shuttle of the now. It takes flight on the autobahn, building speed swiftly though not too silently--there's a slight amount of wind noise at the tops of the doors, and the smaller-displacement turbo churns out a pleasant brap that can linger a little too long in the cabin. The seven-speed dual-clutch transmission couldn't be more in tune. There can't be any dithering in the Macan's electronic steering at autobahn speeds, and there isn't--and when the Macan S is tapped out of its Sport mode, it's truly relaxed. We'd still add on an infotainment package ($2,990) and a bundle with more premium features like a panoramic roof ($5,990), which puts the Macan S at $61,235. And to goose its dynamic profile, we'd also add three-mode-adaptive shocks (a $1,360 package), a torque-vectoring system ($1,490), and the Sport Chrono package ($1,290). The adjustable dampers give the Macan more roll stiffness, while the torque-vectoring setup gives the rear wheels the ability to draw down torque on the inside wheel via an electronically controlled locking differential across the rear axle. Sport Chrono adds a lap timer to the gauges, a launch-control mode, and quicker execution for shifts and throttle inputs. 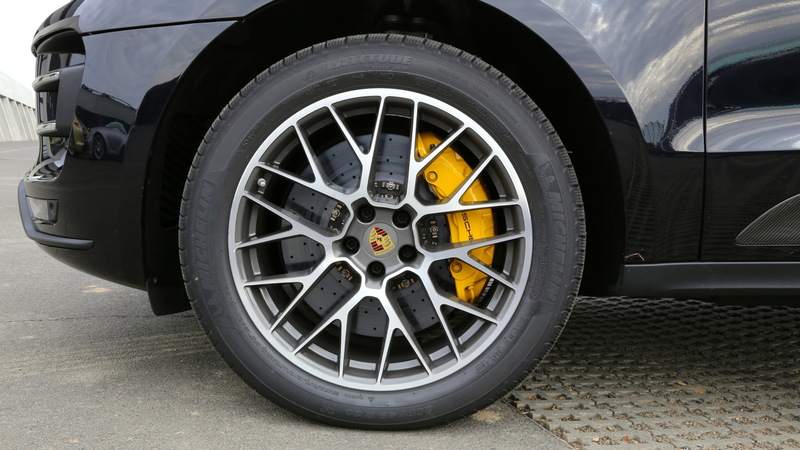 All combine with Porsche Traction Management (PTM), which sends torque to the rear wheels at all times, and varies its torque split back to front, with the capability to send all of it to the fronts. It handles beautifully, utterly predictable so long as the stability control stays on, steering with precision, landing shifts exactly when they're called for, settling briskly into corners, powering out with a flicker of torque to the outside wheel. 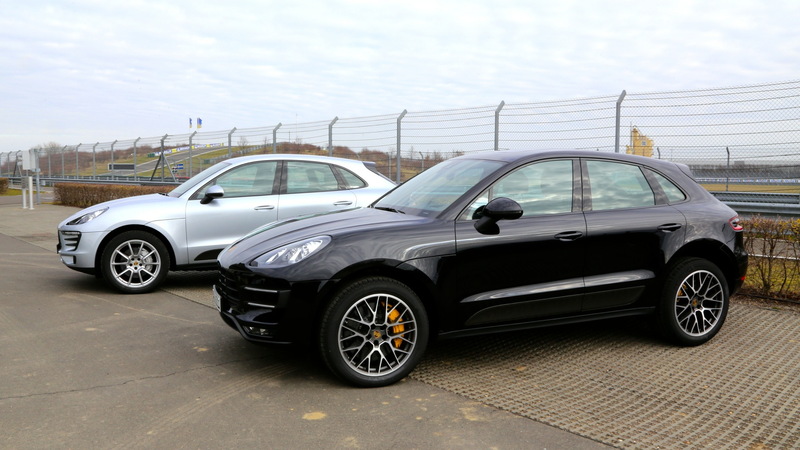 But as strong as it is, the Macan S struggles to keep pace with the Turbo on the 2.3-mile circuit at Leipzig. The Macan Turbo hustles through corners with the liquid flow of mercury. The adaptive dampers are standard; along with Sport Chrono and torque vectoring, an air-spring-and-damper suspension is an option ($2,745, including the adaptive shocks--keep reading). Of course, 60 extra horsepower makes a difference. The Macan Turbo pumps up displacement to 3.6 liters; its V-6 can launch to 60 mph in 4.6 seconds, or 4.4 seconds with Sport Chrono. Top speed is 165 mph. The split between the S and the Turbo doesn't even span out a full second, but the perception plays out a little differently. If any SUV could be called unflappable, the Porsche Macan Turbo can. It blows by sluggish autobahn traffic in vast, Amtrak-sized chunks with a part-throttle foot on it. 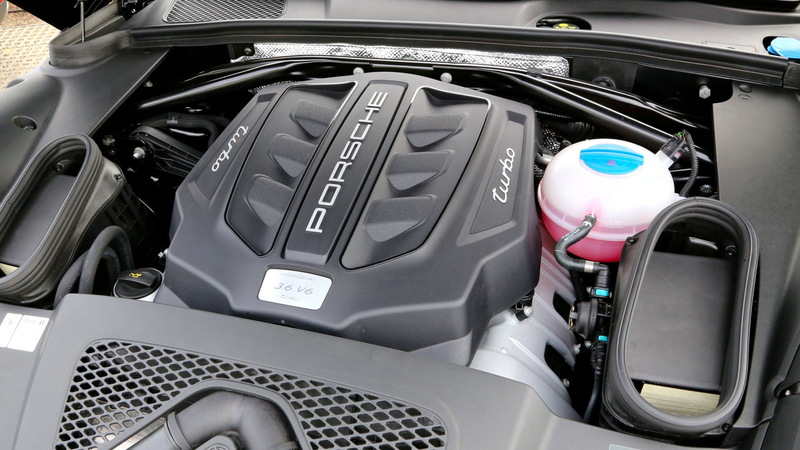 With plenty of wastegate noise and a deep-throated exhaust, the Macan Turbo drives as if it could light up the neatest, cleanest driving line from beneath the pavement. Yank it into a steep right-hander, and it falls into line, complying with a bare second of tire noise. Paddle down, and crank out of a corner, hopping curbs to save a hundredth of a second, and it resets itself, shuffling torque to the outside wheel, passing briefly through a mild stage of understeer. It's really, really hard to overcook it inside its Sport+ modes--and even if you do, it takes just a brief pause to let it blur over your, er, oversights, and blaze on. 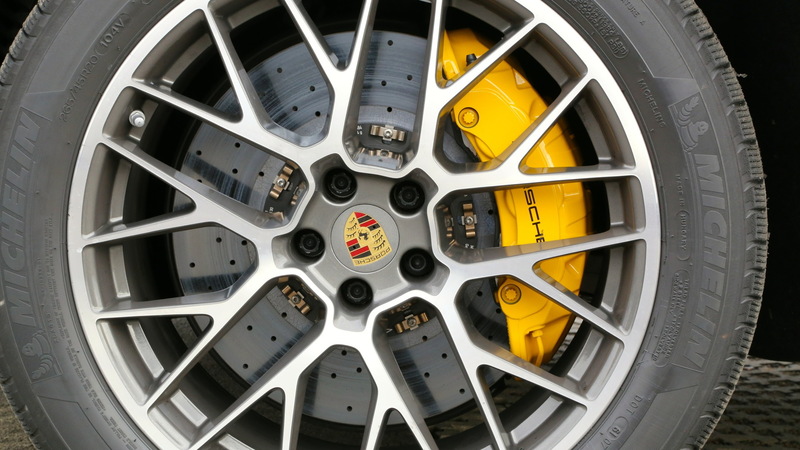 Massive brakes are the picture of confidence--upsized a half-inch in front on Turbos to 14.2-inch rotors, and 1.2 inches to 14.0 inches in back, all with six-piston front calipers. It's almost impossible to get the Macan Turbo flustered, even if one of the great writers and drivers is pressing badge on your rear glass, while Porsche's North American CEO is riding shotgun. Even if said Macan is riding on no-season treads chosen because February is a fickle thing. All Macans ride on standard 19-inch, 55-series tires--Michelin Latitude Tour HP all-season treads on our late-winter drive in eastern Germany, staggered 235/55 front, 255/50 rear. Wheels can be sized up to 21 inches, or downsized to an 18-inch lightweight design at no cost. The ne plus ultra setup, and the one the most expensive and most rugged Macans will sport, swaps out the steel coils for air springs coupled to the adaptive shocks. All Macans have an off-road mode that diddles with shifting patterns and torque distribution, up to 50 mph. And with 7.8 inches of ground clearance and hill-descent control, the Macan S will trundle through mud pits with the aplomb of an Evoque, with the bonus of its air springs lifting it an additional 1.58 inches for more than 9 inches of ground clearance when needed. The air suspension will also drop the Macan 0.59 inches for aerodynamic smoothness at high speeds, or nearly two inches in a luggage-loading mode. If there's a line you must draw in the options sand, it's probably here. How many Starbucks are surrounded by mucky riverbeds anyway? The Macan shares some bones with the Audi Q5, but it's notably wider and longer, and the driving position is lower--lower even than the Cayenne, by almost 2.8 inches. The relationships are at once familial and complex, just like the VW Group itself. The Macan may start from some Q5 architecture, but it gets its own high-strength steel body and doors, and has aluminum hood and tailgate skins. By the numbers, the Macan is larger than the Q5, at 75.7 inches wide (+1.0 inches versus Q5), and 185 inches long (+3.4 inches). The wheelbase is the same, at 110.5 inches, and height is down to 63.9 inches (-1.3 inches). Against the Cayenne, it's nearly six inches shorter overall, and down 3.5 inches in wheelbase. We can easily see the Macan's dimensions iterating into a next-gen Q5, while the Cayenne could adopt the seven-passenger configuration of today's Q7 as it grows out of Macan territory. The Macan suits four adults just fine. The Porsche-class accommodations bring standard eight-way power front seats, standard leather upholstery, and an option for 18-way front seats in the Macan S (they're standard on the Turbo). The 18-way seats are fantastic, with high side bolsters, thick lumbar bladders, and heating with available ventilation. The controls wall off driver from front passenger, with the two-dozen-plus buttons on the console flagrantly defying the trend to touchscreen all the things. Rear-seat head and knee room are where the Macan fades in the Cayenne comparisons. The bottom cushion is low and short, still ample for adults to use--but adult knees will make contact with the front seatbacks holding six-footers, and the sunroof puts the headliner to the heads of big back-seaters. The utility part of the equation is executed well. Doors have deep bottle pockets, and the center console's more generous than in many German SUVs. The Macan's rear bench splits so that a slim middle section folds independently to create an armrest. All three sections fold down to expand the cargo space and to render the Macan a two-seater, in true Porsche style. With the rear seat up, there's 17.7 cubic feet of space; seats folded flat, it's 53 cubic feet. There's storage below the cargo floor, the tailgate's power-operated, and with the air suspension, the Macan has a low mode for easier cargo loading. Your basic Macan S sports a fair and balanced amount of gear for its $50,295 pricetag--all-wheel drive, Bluetooth, a rearview camera, leather seat surfaces, power heated front seats, a power tailgate. From that starting point--on through the $73,295 Macan Turbo--it's a tilt-a-whirl ride through Porsche's impressively listicled options smorgasboard. You can have adaptive or air suspensions, off-road kit, carbon-fiber trim, a multitude of leathers and suedes, a fantastic 16-speaker Burmester sound system, mobile connectivity, navigation, and 20-inch (or 18-inch or, heck, 21-inch) wheels and summer tires, if you want them. For safety, the requisites add that all-wheel-drive system, with options for lane-keeping alerts, blind-spot monitors, and adaptive cruise control. Go full-tilt, and a Macan Turbo can easily pass the $100,000 mark. In a decade since Porsche wended its way into the profit-rich world of sport-utes (and giving cause for Lamborghini and Bentley utes to come), the prejudice against performances crossover utes has just...dissolved. Jeep has one. Mercedes has a few. Land Rover, from what we understand, has quite a few. The Macan makes a logical, if not shattering, next step for Porsche. When it goes on sale late in the spring, it'll have a lower base price to lure in a new niche of buyers who maybe can't stretch into a Cayenne. And fret though some of us insiders may, there's no family war brewing. You can spend more than $100,000 on a Macan--but a great one is about $81,000. A truly great Cayenne is in the hundred-grand ballpark, with top versions retailing for more than $200,000 fully trimmed. The top Audi SQ5 starts at just over $51,000. Anyone worried about overlap, shouldn't. Selling 15,000 a year will be kein problem. If you're already configuring your Macan on the Porsche site, we'd suggest you take a long look at that limited-run SQ5 before you ante up for a purely base $50,295 Macan S. (Also, good luck finding one.) Your compromise position: a Macan S with navigation, a panoramic roof, three-mode shocks, torque vectoring, Sport Chrono, aluminum trim, and Bose audio, for $64,825. No holds barred? In almost every slide that projects out of our brain, it's the Porsche Macan Turbo that parks front and center, full frame. It's not the best SUV we've ridden in, or taken off-road. It's the best one we've driven--and that semantic difference makes all the difference.